Join In Online for FREE newsletters about the wisdom traditions, updates about FREE Streamed Soundings, Four Times a Year, The weeks surrounding the Earth's Equinoxes and Solstices. The World Sound Healing Organization is a non profit organization, uniting with organizations world wide, to create a world at peace, at one with each other. We are also working with indigenous elders, and accomplished leaders in spiritual and healing disciplines worldwide, to bring forward the insight and wisdom they have to offer. a stirring 8 minute tribute reminding us of the Beauty, Sanctity, and Oneness of All Life. Join our broadcasts of many luminous teachers in the field of human consciousness, and traditional elders of indigenous wisdom. Do what you can to serve this magnificent Earth, to preserve and protect Her, and Her many Peoples, and to help in this time of great Human Transformation. Share this program message with others. The power of sound touches and moves us deeply because we are vibrational beings in nature. Cultures the world over use sound to attune, invoke, and transform consciousness. By integrating prayer, song, and chant, with clarity and intent, we can create a magical framework of healing potential for us and the planet. We have the power to transform. We are uniting with organizations world wide to create a world at peace, at one with each other. We are also working with indigenous elders and accomplished leaders in spiritual and healing disciplines, to bring forward the insight and wisdom they have to offer. If you can assist our efforts, by making any contribution, we are deeply grateful. It will insure that these and other services, including our free web casts, continue! If you could not join us in this broadcast, you may listen to the archive here. Join us, with world-renowned violinist Daniel Kobialka, who embraces both the classic and the avant-garde in his search to create sounds that enliven and heal. At age 15 Daniel made his concert debut at Carnegie Hall, and also appeared as a soloist with the Boston Symphony Orchestra. Four years later, he made his critically acclaimed recital debut at Carnegie Hall. (There is about 7 minutes of music prefacing our introduction to Daniel. Daniel Kobialka is widely sought after internationally as a performer and lecturer, as well as composer. He has performed at major events in Europe, Taiwan and Japan where his recordings are best sellers. In order to freely pursue his own interpretations of the classics, as well as his profound interest in more avant-garde music, Kobialka founded his own record label, LiSem Inc. which has sold millions since its inception in 1981. Based in The Netherlands, MWB takes music where it is needed most, including to refugees within The Netherland’s own borders. A program called ‘Singing the Bridge’ uses the sharing of folk songs to bring together refugee, migrant, and native Dutch women. Building peaceful multicultural societies is something we associate with countries such as Iraq, mired deeply in a civil war, but the U.S. is a melting pot, and globalization mingles us all. Truly was there ever a greater need for sharing each other’s songs? My album ‘World on a String‘ draws on my deep sensitivity to the thread of ‘human-ness’ that runs through and connects us all. Music is a universal language that speaks both to our commonalities and our diversity, and this album is my gift to all hearts and souls who share this magnificent world. 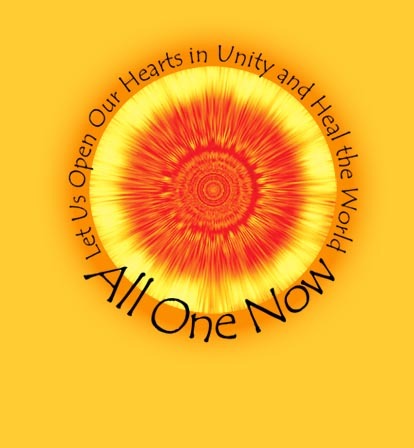 All One Now is a venture of the The World Sound Healing Organization, in co-operation with individuals and organizations seeking positive change for all humanity. project of Spectrum Arts and Education for Peace, inc., dedicated to world peace. and respect for each other, are highly appreciated, and will insure the continuation of these services. Founders of All One Now & the World Sound Healing Organization offer their bios. All One Now is a venture of The World Sound Healing Organization, in co-operation with individuals and organizations worldwide. and respect for each other, are highly appreciated.